7. "Protestor with Israeli flag": agitating for more government protection against terrorism, Eilat. 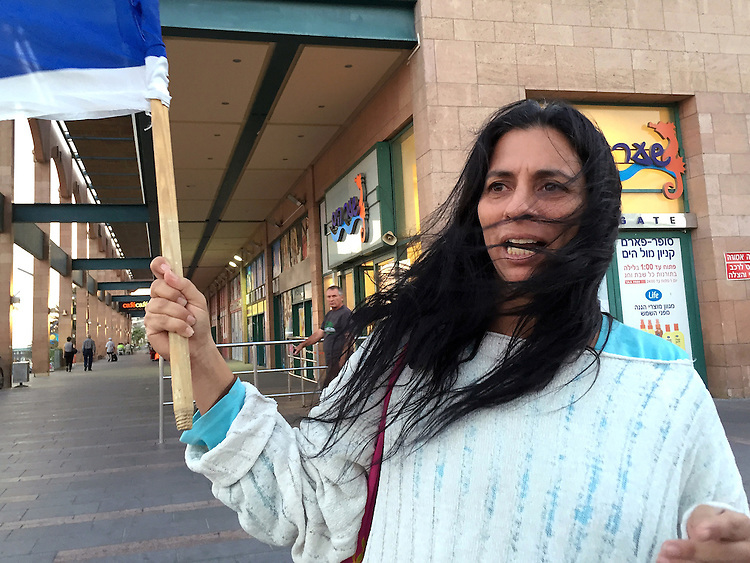 When I encountered this woman waving the Israeli flag next to a shopping mall, I spoke with her at length. She explained that she felt the government wasn't doing enough to protect Israeli citizens. That morning, a terrorist attack in Jerusalem had killed police and bystanders alike. Eilat is located at the southernmost tip of Israel, where Israel's border meets those of Jordan and Egypt. Ironically, although Eilat saw no combat in Israel's 1948 War of Independence, this is the site where, much like our historic flag-raising at Iwo Jima, Israel's flag was then raised in victory.